That’s some of what’s happening here as the partial shutdown of the federal government heads into its third week, the result of an ongoing stalemate in Washington, D.C., between Congress and President Donald Trump. Compared to other states, Alaska has one of the highest percentages of federal employees making up its workforce. There were about 15,100 jobs in federal government here in 2017, according to the latest annual average from the Alaska Department of Labor and Workforce Development. That doesn’t include uniformed military members and private contractors. Forecasters with the National Weather Service are continuing to work but not getting paid, said David Levin, a National Weather Service Employees Organization union steward for the forecast office in Juneau. There’s still work to do, putting out watches, warnings and advisories. For the most part, he said, forecasters are keeping a “pretty good attitude” about the situation. A spokesman for the Federal Aviation Administration also wasn’t available to answer questions. His automated email response said, “Due to the lapse in government funding, I am off work." His email referred questions to another FAA employee, who did not respond to emailed questions Monday. Among federal workers, there’s a sense of fear, said Dave Owens, a representative in Alaska for the American Federation of Government Employees union. At the National Weather Service in Juneau, Levin said there are varying levels of comfort with missing a paycheck. Transportation Safety Administration officials last week said there was a rise in “sick outs” from employees at airports around the country. The shutdown has had “no impact in operations” at Ted Stevens Anchorage International Airport and Fairbanks International Airport, said Department of Transportation and Public Facilities spokeswoman Meadow Bailey. “Not seeing delays due to staffing shortages, nothing like that,” she said Monday. At the heart of the shutdown clash is Trump’s insistence on getting funding for a wall at the U.S.-Mexico border. Rep. Don Young supports the ongoing negotiations between House and Senate leadership and the White House and believes that it will result in legislation that ends the shutdown, Young’s chief of staff Pamela Day said in an email. Sen. Dan Sullivan “is hopeful that negotiations currently ongoing between Speaker Pelosi, Minority Leader Schumer and the Trump administration come to an agreement in short order, and allow this partial shutdown to end,” spokesman Mike Anderson said in an email. A spokeswoman for Sen. Lisa Murkowski did not respond with answers to questions by early Monday evening. For some agencies, there hasn’t been much disruption. Federal courts in Alaska will continue to conduct business as usual, even if no new funding appropriation is made by the deadline of Jan. 18. “It won’t change what we’re doing on a daily basis here,” said Stephanie Lawley, chief deputy clerk for the U.S. District Court of Alaska. Civil matters in which a person or group is suing a federal government agency that’s part of the shutdown may be “held in abeyance,” according to an order released by the court on Dec. 28. The Indian Health Service said 13 employees are furloughed in its Alaska office. Some furloughed federal workers in Alaska have started to apply for unemployment insurance, said Neal Fried, an economist with the state labor department. It’s “just too early” to measure what the broader economic impacts of the shutdown might be, he said. 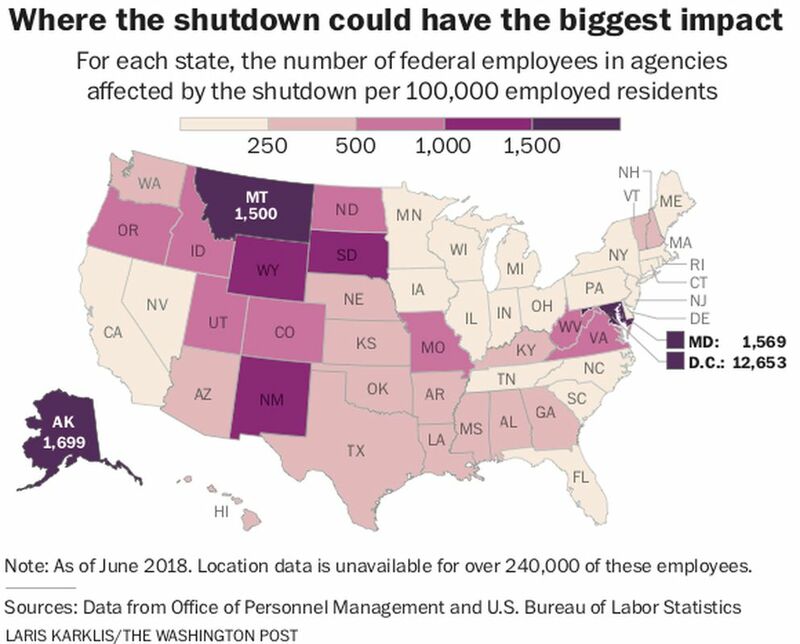 While difficult to measure, other impacts of the partial shutdown include closed offices that serve customers. The Campbell Creek Science Center is closed in Anchorage, as is the Bureau of Land Management administrative office where people can do business related to mining claims. One veterinarian said he’d been accredited through a federal program but was waiting on an official approval needed before he could legally sign health certificates for animals to travel. The Centers for Disease Control and Prevention’s Anchorage quarantine station -- one of 20 in the country -- is operating normally during the shutdown. It is not clear whether some employees at the CDC’s Arctic Investigations Program, headquartered on the Alaska Native Health campus, are also furloughed. The CDC said it would be “open for business as usual” as of Jan. 23. Most immigration courts are closed. In Anchorage, people facing deportation appear by video link before immigration judges in Portland, Oregon, at hearings every few months. Any hearings scheduled during the shutdown would be rescheduled.